Oleg Kagan was born in 1946 in Sakhalin, in the extreme East of the Soviet Union. There his father worked as a surgeon at the Military hospital until shortly after the war when he moved to Riga, Latvia, where Oleg spent his childhood. His father, from a highly educated Jewish background, was passionately interested in music. In fact, at young age he had been filled with the desire to become a violinist, a dream which died in the turmoil of the First World War. Oleg’s mother, a nurse by profession, had an immense love of the theater when she was young, an enthusiasm hardly supported by her modest home in a small town of Northern Russia. After an early, rather liberal education by the violinist Joachim Braun at the music school of the Riga Conservatory, the boy at the age of thirteen was heard by the great teacher Boris Kuznetsov, who took him to Moscow, to study with him at the Tchaikovsky Conservatory. Kuznetsov, an old-style pedagogue in the 19th century tradition, had the boy – as the only one of his pupils – live at home with him so that he could supervise every detail of his training and education. The strictness of his regime laid the foundations of a transcendental technical assurance and discipline for which Kagan was to remain grateful for the rest of his life. Beyond his violin playing Kagan was a deeply cultured man. He was fascinated by all kinds of literature and adored paintings. Later on, he made it his business to get to know the architecture and art galleries of the different cities that his music took him to. His years in Moscow were also the years of the first democratic wave under Khrushev when all of a sudden forbidden literature like Achmatova, Mandelstam, Paternak and Solzhenitsyn could be read and forbidden paintings by masters of the stature of Piccaso, Kandinsky and Malevitch became accessible. This opening of cultural frontiers had a powerful impact on Kagan’s artistic and intellectual development in the presentation of contemporary music in the Soviet Union, an involvement which included without saying also material support of outlawed artist friends. Kuznetsov was so convinced of the outstanding talent of his pupil that in 1965 he allowed the nineteen year old Kagan to enter the Sibelius Competition in Helsinki. Kagan won the First Prize and also the hearts of the Finnish audience (his Sibelius Violin Concerto from that competition appeared on LCL 143). Of course the prize was an extremely important step forward for the young musician; but it was perhaps the warmth of his reception by the public in Helsinki that meant most to him later. Particularly in recent times, when Kagan was finally allowed to travel abroad, he returned to Finland over and over again, often to play his inspiring part at the center of the Chamber Music Festival of Kuhmo. Together with his wife the cellist Natalia Gutman and later also with their children, Maria and Alexander, he would relax in the Finnish countryside, recover his strength and revel in the chance to spend weeks at a time in a fabulous artistic atmosphere and far away from any professional pressure playing for an enthusiastic audience. Soon other high awards followed, in 1966 the Second Prize at the Tchaikovsky Competition in Moscow and two years later the First Prize at the J.S. Bach Competition in Leipzig. His studies with Kuznetsov came to an end by the sad and sudden death of his teacher and he passed into the class of David Oistrakh. Years later Kagan paid a touching tribute to the older mentor: ‘Oistrakh exerted a tremendous influence on me. For his pupils he was like a father, a counsellor and a friend’. Kagan’s close relationship with Oistrakh did not end with his graduation from the Conservatory. In fact, if anything, it may be said to have deepened. Those who knew both men at the time report that Oistrakh was particularly thrilled with the young Kagan’s playing of Mozart. Certainly he seemed to have inherited something of those qualities that people still remember about Oistrakh’s own Mozart playing but he also brought a unique quality of his own which evidently appealed deeply to the older man: mysteriously mature innocence, a feeling of lightness and strength combined that showed complete knowledge of the music, without that knowledge ever seeming to become knowing or complacent. In fact, Oistrakh was so enthused by what he heard that he recorded all the Mozart concertos with Kagan playing the violin and Oistrakh himself conducting. At the end of the sixties Kagan was introduced to Sviatoslav Richter. This became the foundation of a close friendship and artistic collaboration that lasted for more than 20 years. What Kagan admired so much in Richter’s personality was ‘his devotion to music without ever compromising, his self-criticism and honesty’ which kept his playing at all times free from any pose. Here the modest Kagan used to enumerate virtues which he himself had in abundance – perhaps without even realizing it. Like Oistrakh, Richter was extremely excited by Kagan’s playing of Mozart and suggested that they perform together the Mozart Violin Sonatas. Years later, Kagan still remembered how embarassed he was at the time at the great pianist’s unshakable faith in the young violinist’s approach to Mozart. The recitals from 1975 and 1982 on LCL 122, LCL 123 and LCL 102 transmit something of the high spirits, the graciousness and depth of the playing of these two men. Kagan perfectly understood what lay behind Richter’s dislike of the recording studio: an almost religious devotion to the inspiration and spontaneity of open performance. Together, and over many years, the two men made music in an almost incredible variety of different situations, from working men’s clubs in Siberia, collective farms in White Russia, concert halls in the Caucasus, tiny music schools in Middle Asia, to museums and art galleries in Moscow and even private flats. Also the classical composers held such a prominent place in their repertoire these two musicians shared also a vital interest in the music of the 20th century, and, in fact, it was the very beginning of their musical partnership that Richter asked Kagan to play with him Berg’s Kammerkonzert. Richter shared with performers of Kagan’s generation something of the intense excitement of the early sixties, when music that had previously been forbidden or forgotten, was suddenly available to play. And for both musicians, this meant especially the music of the Second Viennese school of which Richter and Kagan have, separately and together, given very fine performances, as especially Berg’s Kammerkonzert and Berg’s Violin Kagan’s keen and even omnivorous interest in everything new and unexpected, naturally led him to the newest music, and especially to the music of Denisov, Gubaidulina and Schnittke. He could be its passionate advocate and many composers wrote pieces for him, including Sofia Gubaidulina, Vassily Lobanov, Tigran Mansurian and Alfred Schnittke, Undoubtedly it was Schnittke to whom he felt closest. Kagan’s performance of Schnittke’s Second Violin Sonata remains the composer’s favourite. And, as if in return, Schnittke wrote several works especially for Kagan, the first one being the Third Violin Concerto in 1978. 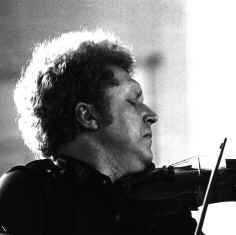 Apart from his work with Richter, Oleg Kagan had teams and partnerships with many other musicians. These included, in particular, his first wife, the pianist Elisabeth Leonskaja and his friends, the violinist Yuri Bashmet, the clarinettist Eduard Brunner, the composer-pianist Vassily Lobanov, the pianists Alexej Lubimov, Vladimir Skanavi and Elisso Wirssaladze and, last but not least, members of his family. Throughout the last twenty years of his life he and the cellist Natalia Gutman, two whom he was also married, formed a steady ensemble. Together and with their circle of many friends they played innumerable concerts, of chamber music and concertos, from Bach and Beethoven, Schubert and Brahms through Ravel and Honegger to Gubaidulina and Schnittke. One of the first results of Oleg Kagan’s and Natalia Gutman’s growing international careers in the early eighties was that they started to appear together in many countries playing the Brahms Double Concerto (LCL 175). It was partly inspired by their success in this work, that Alfred Schnittke decided to write them a Double Concerto of his own, his Concerto Grosso No.2 of 1982. It was their playing together too that motivated the composers Tigran Mansurian and Anatol Vieru to dedicate Double Concertos to them. Whatever happened in his concert career, Kagan never lost his love of what remained for him the first and foremost way of making music: in a small room, and often at home, and with friends. Together with Natalia Gutman he established what was nothing less than a private festival every summer in the beautiful medieval town of Zvenigorod, an hour’s drive to the south-west of Moscow. In a lush green valley that runs beneath the town they rented several neighbouring dachas. There, with as many friends as they could gather together, Kagan and Gutman every day would meet to play music and even put on plays and operas together. This may sound like nothing but holiday high-jinks but for those who knew Kagan, such things appeared entirely consistent with the rest of his musical life, as though they were a bright connecting thread of excitement and enthusiasm that could draw together the lightest fun and the most serious performance. Something of the character of this man, of his generosity and openness to those who listened or who played with him, can be heard in the recordings from the Kuhmo Festival in Finland. After Kagan’s death many of them were kindly put at our disposal and will be released within the Kagan Edition. Among the ones already published are Messiaen’s Quartet for the End of Time (LCL 712), Ravel’s Duo-Sonata for Violin and Violoncello together with the first performance of Gubaidulina’s „Rejoice!” (LCL 121), Brahms’ Piano Quartet op. 25 and Dvorak’s Romantic Pieces for Violin and Piano op. 75 (LCL 124). Beethoven’s Trio op. 9/1 (LCL 141) and Schubert’s Octet op. 166 (LCL 101). In 1989 Oleg Kagan began to fell seriously ill and underwent a series of operations and medical treatments. With a courage and will that astonished everyone who met him, he determined to play for as long as he was able – and even longer. He traveled relentlessly giving concert after concert. It quickly became clear that a deep change had come over his playing. Audiences everywhere reacted in the same way, recognizing that they were hearing violin playing of a kind that was no longer simply performance but rather a form of revelation. One of Kagan’s last plans had been to make yet another festival: in Wildbad Kreuth, an idyllic village in the Bavarian Alps. Together with his wife Natalia Gutman he went on planning this festival during his illness and wanted it to be an occasion for his friends from Russia and his friends from the West to make the kind of intimate music he loved so much. When the time came, Kagan was pronounced too ill to leave the hospital in Lübeck, but he went nonetheless and his friends came. At the beginning of July he was helped on the platform. A special chair was found on which he could, almost standing, play the violin. With the clarinetist Eduard Brunner, his step-son Sviatoslav Moroz, the violist Kim Kashkashian and his wife Natalia Gutman, he gave a performance of Mozart’s Clarinet Quintet. Shortly afterwards he played for the last time, together with Yuri Bashmet one of the greatest of all Mozart’s masterpieces, the Sinfonia Concertante. On July 15, 1990 immediately after the end of this, his own festival he died in Munich. These last concerts in Kreuth will remain as a memorial to the courage and spirit of a musician for whom music had always been the true touchstone of everything that he believed in and wished to share with those around him.